Since I’m a character-driven writer, that’s the first place I start. I don’t like to think of them as fictitious entities. Rather, I try to think of them as real people, separate from me. In order to do this, I need to find the picture that fits the person in my head. I scour Google Images, pouring through countless pictures by using obscure and generic keywords. I have learned that if you search anything having to do with “blonde” and “boy,” you are pretty much guaranteed to get the guy from One Direction. You might get Draco Malfoy if you mention anything about thinness, but it looks like Niall Horan has monopolized that entire demographic. I found that if I can see my characters as I write, chapter for chapter, scene for scene, they take on a mind of their own. They no longer belong to me, and it frees me from the writing process. This book is their story, the pictures helping to breathe life into my characters. At times, they took on a life of their own, making me realize that I wasn’t fully in control of how their stories unfolded. I truly believe that I didn’t tell their story, but rather, they told it to me. The only two who really didn’t have a “creation stage” were Dani and Keely. I didn’t have to pick their names or define their character tics; they just sort of appeared on my computer screen one night. As I’m sure other writers can attest, it is a strange experience to have characters come to you as if they are living, breathing beings. They are the type of characters who stick with you, and there aren’t any other two girls I would rather bring to life for my debut novel than Dani and Keely. I had always thought that death would be cold. When I reached that edge in time, straddling the line that separated me from this world and another, I prepared for it to come. I waited for the freeze to creep through my body, spoiling the ending of my own sorry story. Instead, all I felt was con-suming heat. It was a living thing inside of me, an arsonist that took shelter within my bones and reminded me of the pain one last time. I knew in that moment, I was already halfway to hell. When I was younger, my dad would tell stories about where we go when we die. Heaven was a little different each time, but he would say it is a place where the birds always sing. I liked knowing that no matter how we die, we still exist somewhere. It made me feel better thinking my favorite cat had four acres of felt towers all to herself and that my great-aunt Hel-len was sipping her red drink on a lawn chair somewhere. “Can we visit heaven sometime, Daddy?” I asked. He was the best at coming up with the stories but never knew quite how to finish them. As always, Mom swooped in and rescued him. “The thing about heaven is that you have to be old enough to go,” she said. “Kind of, but you won’t be able to cheat and wear your soccer cleats to get in,” she said, while tickling my rib cage. She had a tendency to do that—using diversion as a way to get out of an uncomfortable situation. “So how old do I have to be to get in?” It was one of the few times I remembered her at a loss for words. The moment only lasted a few se-conds, but she eventually found the perfectly scripted answer. “Well, it doesn’t really work like that, doll. Not everyone is the same age, because people go to heaven at different times. But someone told me a secret once. He said I couldn’t tell you until you turned seven, so I don’t know if I’m allowed to.” I felt the excitement swell inside of me. It was the kind that far exceeded seeing Mickey Mouse for the first time or being told I was getting grilled cheese for lunch. It was the feeling that I was finally old enough to handle the truth. “But I am almost seven. We did summer birthdays in school so my teacher said I’m pretty much seven. Lenny is seven, and I’m already taller than him. And I can read a whole Berenstain Bears book all by myself. And I stopped sucking my thumb. You told me that if I stop sucking my thumb, then I get a surprise.” I hoped that she didn’t know Lenny was the smallest kid in class. “Even Florida?” I asked in wonderment. “Even Florida,” she said as she pulled back to look at me with her smiling eyes. That afternoon I started a to-do list of everything I wanted to accomplish in my lifetime. I got as far as “build a birdhouse for the back-yard” before my sister found me holed up in our secret hiding place. She showed me how to catch crayfish with my bare hands that day, and by dinnertime, I had already forgotten about the man and his story. I found my list a couple days later but didn’t add anything more to it. Besides, I had a hundred years to figure out how I wanted to spend it. It was strange how those moments came flooding back when I least expected. I started to remember the little things—the happy things. But then they were replaced by the memories of how it all fell apart. The girl with the to-do list couldn’t exist anymore—not inside the person I had become. It was a scam—the idea that everything happens for a reason. It didn’t leave room for the tragedies, the things in this world that didn’t make sense. When the burn started to subside, I could feel myself slowly slip away. In that moment, I realized the man had been wrong about two things. One, he overestimated the good inside of me. And two, I would never live to be a hundred, because I couldn’t even make it to sixteen. As that precious nothingness enveloped me, I sensed her hand in mine, holding me back. I could feel the clamminess of her palm and the coolness of her skin soothing my scorched bones. We were together again, but this time she was asking me to stay. The last thing I remembered as I headed over that edge was to never let her go. I knew she’d always been the one to build me wings for the way down. 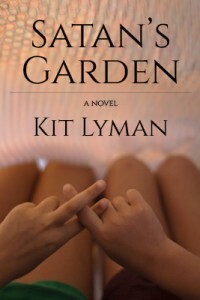 “Satan’s Garden” is Kit Lyman’s debut novel, which she self-published in March of 2014. A 2011 graduate from Cornell University, she has prior experience in screenwriting and script coverage. She previously worked in LA as a production assistant on a daytime talk show and a script reader for a literary management company. Her former work as an SEO and web strategist has given her a competitive edge as a self-publisher, but she still believes in the role traditional publishers play in today’s market. She currently resides in San Antonio, Texas.